…than the common three-pillar conceptualisation. The three pillar model, grounding sustainability on economic, environmental and social aspects, has become a commonplace intellectual framing whenever there is a need to defined and explain the scope of the concept (, Fig. 1). 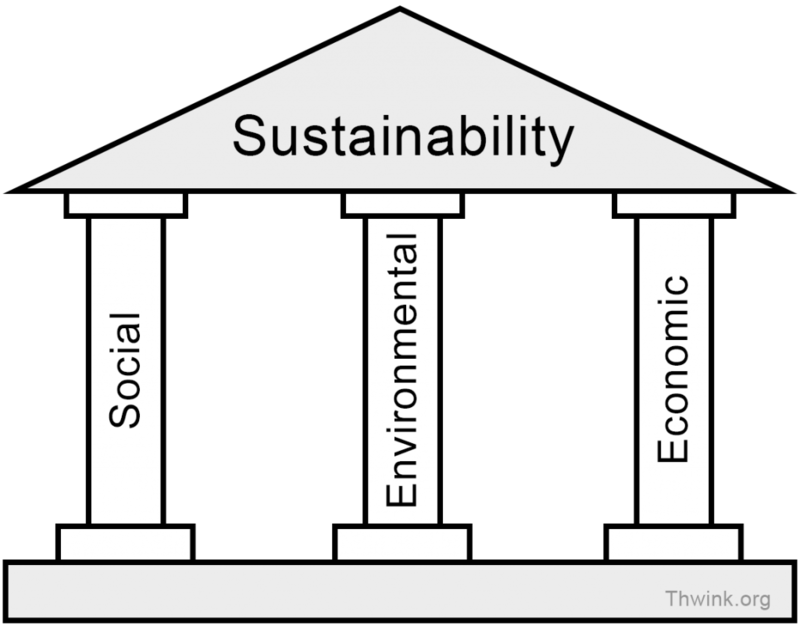 Here, I argue that two of the pillars: the environmental and the social ones, are more fundamental to the ultimate goals of sustainable development and should thus play a more prominent role than the economic dimension, and I suggest a modification of the three pillar model that reflects the different hierarchy of sustainability aspects/pillars. It was suggested to extend the three-pillar model to include other aspects as well, most prominently the cultural aspect , or to blur it to cover a whole bunch of dimensions (17) under the umbrella of the UN’s Sustainable Development Goals . All these additional pillars, goals, and aspects have a clear link to “meeting the needs of the present without compromising the ability of future generations to meet their own needs”  and thus to sustainability. At the conceptual level, however, I think that some simplification is both necessary and helpful. In the introductory part of all courses that I teach, I make a reference to the systems approach to studying human-environment interactions, which sees humans embedded in a system that has two layers: a cultural (symbolic) and a biophysical (material) . For social systems to function humans need to organize energy and material flows for their own bodies’ reproduction and the reproduction of the built up capital stocks. The particular arrangement of stocks and flows in society’s biophysical basis, in particular, their distribution across the members and institutions of society, depends on the social rules and frameworks created. The particular way in which the biophysical basis of society is operated determines the system’s environmental impacts. Figure 2: The two-sphere model of biophysical and social spheres of causation. Society is seen as hybrid of the two spheres (Fischer-Kowalski and Weisz 1999) , and the part of the overlap of social and biophysical spheres that is under direct human control is termed ‘societies biophysical basis’, which can be further divided into structures (human bodies and in-use stocks of buildings, products, and infrastructure) and the energy and material processing to operate society’s biophysical structures to supply human demand for products and services. The economy comprises society’s biophysical basic but extends into the natural environment (via ownership of natural assets) and into the symbolic realm (via non-physical relationships such as ownership, money, and discounting). Figure taken from Pauliuk and Hertwich (2015) . Economic activity is now seen as embedded in the social realm and it also has a biophysical layer. 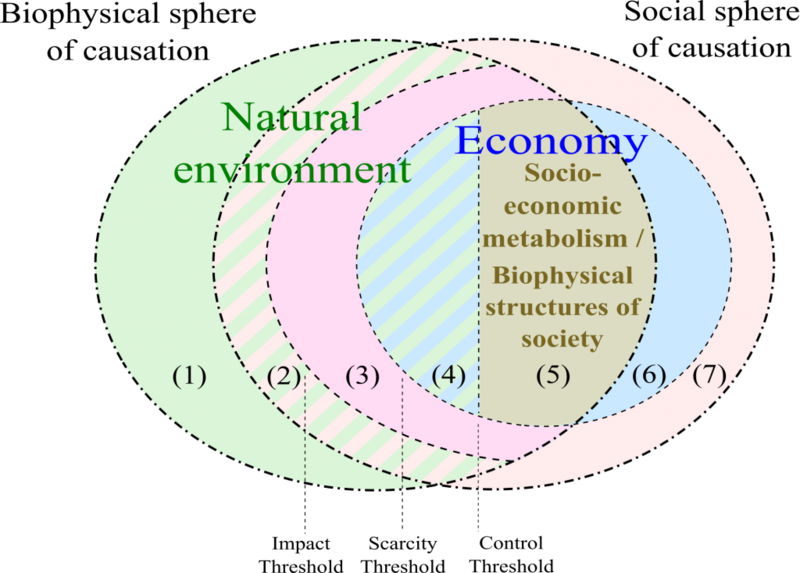 Both the biophysical and the social spheres or layers pose constraints to economic activity, the biophysical sphere via resource scarcity and emissions constrains, the social sphere via supply of labour, allocation of capital to economic processes, human demand for goods and services, and aspects of distributional justice. 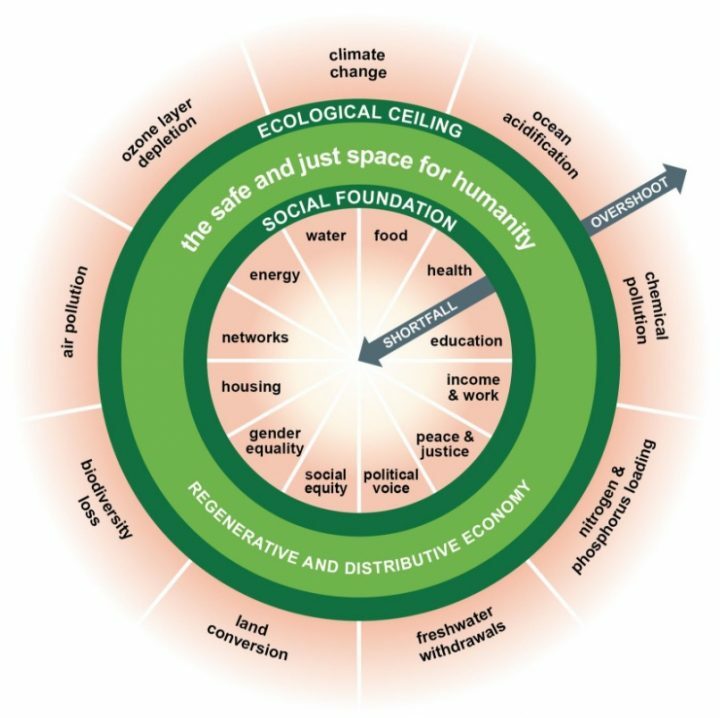 There is probably no better framing of the notion of the economy as a double-constrained system than the doughnut image put forth by Kate Raworth . Figure 3: The ecologically safe and socially just space for humanity. An economy that operates within these two constraints is described as ‘doughnut economy’, though it produces much more than doughnuts. In doughnut economics, social thresholds are met, without transgressing any biophysical boundaries. A conceptualisation of sustainability that is in line with the paramount importance of the social and biophysical constraints should treat the role of the economy differently than just using three equipollent pillars. Figure 4 shows such a concept. 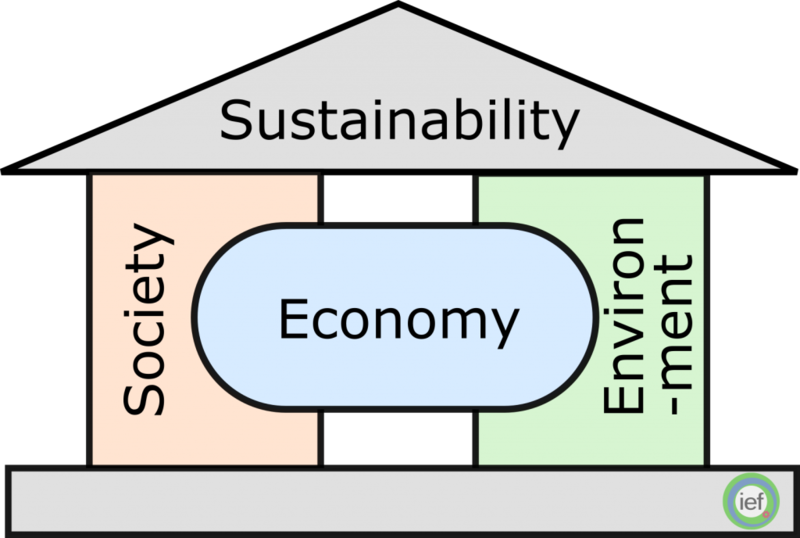 Figure 4: A two-pillar-model of sustainability, emphasizing the paramount importance of the social threshold and biophysical constraint, where the economy is not directly linked to sustainability but to the social and environmental pillars. The magnitude of the environmental problems we face and the billions of people with limited access to a healthy and fulfilling lifestyle remind us that the focus of sustainable development lies on meeting the needs of the global society while adhering to the environmental limits of the planet. We have the knowledge and the capability to design an economy that can achieve these two goals. Whether it will be a growth , steady state,  or de-growth economy remains to be seen, but I don’t think that the magnitude and the growth rate of economic output should be a primary concern in the long run. My vision is that we will design a development and transformation process for the global commodity and service production and distribution systems so that in the end, both, the social and environmental sustainable development targets will be met. For that process, we definitely will need to use performance indicators that amend and differ from GDP, and, who knows, in the end, we may hardly notice that economic output will have stopped growing. References. Accessed between Nov 23, 2018 and Nov 30, 2018. Fischer-Kowalski M, Weisz H. Society as Hybrid between Material and Symbolic Realms: Toward a Theoretical Framework of Society-Nature Interaction. Adv Hum Ecol. 1999;8:215–51. Pauliuk S, Hertwich EG. Socioeconomic Metabolism as Paradigm for Studying the Biophysical Basis of Human Society. Ecol Econ. 2015;119:83–93. Stefan Pauliuk on A note on the differences between process-based LCA and MRIO. Ming Xu on A note on the differences between process-based LCA and MRIO.